（1）Sizes:S, M, L, XL 。。。 。 （2）IMPORTANT REMINDER: Please refer dimension table to confirm your size, and email us your selected size and style and color when you order. We will ship the goods to you in accordance with the information you provided。。。。。.If no information is confirmed, we will ship it to you according to the default color, style and size of the product。。。。 （3） Remarks: 1）Give priority to your waist size；and then consider your bust；only hip style, consider the hipline. 2）Both sides of the wedding dress are reserved for 3-6CM modifications space, you can modify the size of your waistline according to your needs. 3）please make sure measure your naked body size , and then compare the size table and select size。。。。（4）It is recommended for dry cleaning。。。。（5）I want to be impressive at my wedding! 。。。I want to look very special on my wedding day!。。。I want to look very noble elegant and meaningful at my wedding!。。。I want to have unique beauty on my wedding day! 。。。I want to give all guests good friends and families a distinctive image at my wedding! So, a set of special wedding dress is your indispensable choice! （5）Exquisite gift box + exquisite accessories.Reflect the connotation of two thousand years of Chinese costume culture . Traditional elegance combined with modern fashion. Gift for lover. Gift for friends. Gift for girlfriend. Gift for sisters. Gift for bosom friends and gift for yourself. 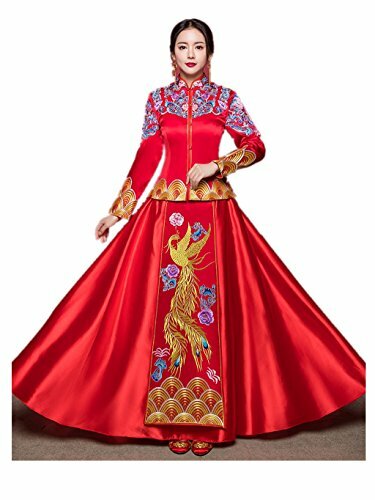 If you have any questions about this product by YY-Bride Wedding Cheongsam, contact us by completing and submitting the form below. If you are looking for a specif part number, please include it with your message.